Prepare sausage patties in a skillet sprayed with nonstick spray or on a microwave-safe plate in the microwave. (Refer to package instructions for exact temperature and cook time.) Once cool enough to handle, crumble or chop. 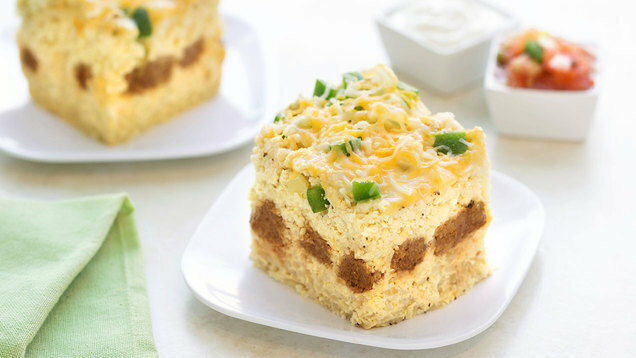 Place frozen hash browns in a layer in the bottom of the slow cooker, and top with cooked sausage. Sprinkle with 3/4 cup cheese. Evenly top with cauliflower rice, onion, and bell pepper. In a large bowl, whisk together egg whites/substitute, almond milk, and seasonings. Evenly pour over the slow-cooker mixture. Cover and cook on high for 3 - 4 hours or on low for 7 - 8 hours, until egg is set. Turn off heat, and sprinkle with remaining 1/4 cup cheese. Cover, and let sit 4 minutes, or until cheese has melted. Using the foil, lift casserole out of the slow cooker. 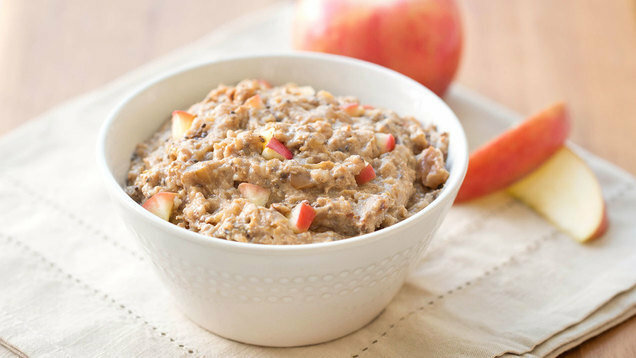 This scoopable a.m. meal has everything: healthy carbs, protein, fruit, flavor... It's got "good morning" written all over it! FYI: Steel-cut oats are a must (see HG FYI). Add protein powder and 2 cups warm water to the slow cooker. Whisk until uniform. Add all remaining ingredients, and mix well. Cover and cook on high for 3 - 4 hours or on low for 7 - 8 hours, until oats have cooked, liquid has been absorbed, and apples have softened. Happy Chocolate-Covered Peanuts Day, February 25th. Want that classic combo for minimal calories? Check out Just Great Stuff Chocolate Powdered Organic Peanut Butter. Mix with water and spread on apple slices! Keep this breakfast train moving -- click "Send to a Friend" to share!